HSSC Notification is out. HSSC is recruiting for 778 TGT Sanskrit Teacher Govt Job (Last Date Extended) Posts. You can check HSSC - Haryana Staff Selection Commission last date, download HSSC notification, visit HSSC official website and check other HSSC Vacancy details.Complete Vacancy and recruitment Details about 778 TGT Sanskrit Teacher Govt Job (Last Date Extended) vacancies in HSSC are provided below by JobSarkari.Com only for you. Last Date of Pay Application Fee. 26/04/2019. Ex Servicemen of Haryana. No Fee. Mode of Payment. Candidate Can Pay Application Fee Through Net Banking or E Challan in Any Branch of SBI, PNB And IDBI Bank. TGT Sanskrit (Rest of Haryana). 311. 175. 129. 615. TGT Sanskrit (Mewat Cadre). 82. 47. 34. 163. Total Vacancy. 393. 222. 163. 778. TGT Sanskrit (Rest of Haryana). Candidate Must Have Passed BA With 50% Marks in Sanskrit as an elective subject and 2 Year Diploma in Elementary Education. Having BA With 50% Marks as well as in Sanskrit as an elective subject And 1 Year Bachelor in Education (B.Ed). Candidate Must Have Passed BA With 45% Marks And 50% Marks in Sanskrit as an Elective Subject and 1 Year Bachelor in Education (B.Ed). Having Class 10th With 50% Marks And 4 Years B.EL.Ed Degree. Having Class 10th With 50% Marks And 4 Years B.Ed. BA With 50% Marks in Sanskrit As An Elective Subject And 1 Year B.Ed As Mentioned in Notification. TGT Sanskrit (Mewat Cadre). Candidate Must Have Passed BA With 50% Marks in Sanskrit as an elective subject and 2 Year Diploma in Elementary Education. 6. Candidate Have to Upload Photo And Signature As Prescribed Size And Format And Have to Pay Application Fee. 8. Online Application can be Submitted on or Before 23rd April 2019. Q. What is the Last Date For HSSC TGT Sanskrit Teacher Govt Job (Last Date Extended) Vacancy ? A. 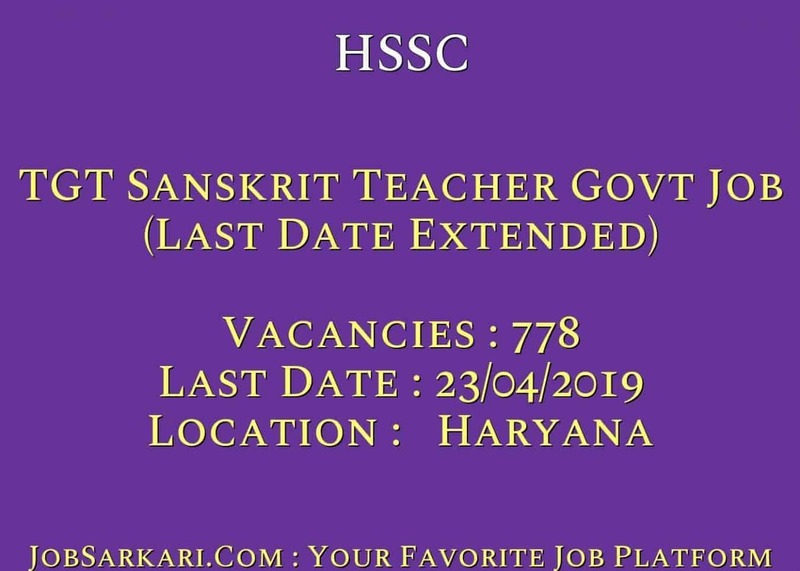 Last Date for HSSC TGT Sanskrit Teacher Govt Job (Last Date Extended) Posts is 23/04/2019. Q. What is the Form Type of HSSC TGT Sanskrit Teacher Govt Job (Last Date Extended) Recruitment ? A. The Form Type for HSSC TGT Sanskrit Teacher Govt Job (Last Date Extended) Posts is Online. Q. 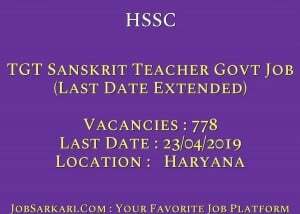 How many vacancies are available in Haryana Staff Selection Commission TGT Sanskrit Teacher Govt Job (Last Date Extended) Posts ? A. There are about 800 Vacancies in Haryana Staff Selection Commission TGT Sanskrit Teacher Govt Job (Last Date Extended) Posts.